« Calendar Numbers – Not Just For Calendars! One of the main reasons I came up with My Obstacle Course was to find a way to engage with Andrew at home while doing reinforcement activities for therapies and school. I found that utilizing a theme for each Obstacle Course allowed me to work on skills in all developmental areas while being purposeful and meaningful for him. The themes can range from a general monthly theme to a specific theme that is reinforcing what your child is learning about in school but what they do is help to tie all the different stations together. I have had many people comment that it must take a great deal of time to prepare the activities and while it does take a little time and preparation (most of which I hope to make easier for you through my posts! ), there are so many easy ways to make activities thematic. For example, it is March and so for the entire month (even after St. Patrick’s Day) I use thematic helpers like shamrock shaped calendar cutouts. 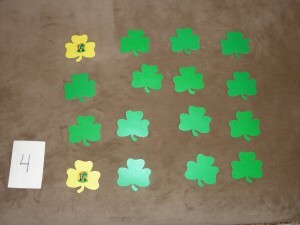 Memory Match game made from shamrock shaped calendar cutouts. 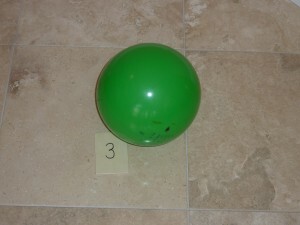 a green ball or balloon for bouncing, tossing, catching, kicking, rolling, etc. 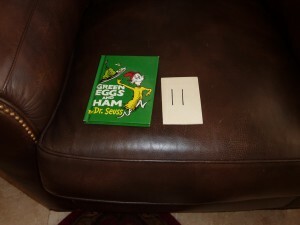 My Obstacle Course Station Activity: Pass the green ball back and forth 10 times. 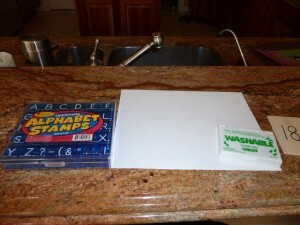 My Obstacle Course Station Activity: Alphabet stamps with green ink. green dice to roll for number identification, addition, subtraction, multiplication – Link to previous post on dice. blue and yellow food coloring in water to be combined to make green with dropper or baster – Link to previous post on using droppers. These easy to put together station activities, along with other ideas I share, make it easy to build skills he is ready for in a way that is fun, colorful and kid-friendly. I encourage you to go on a “green” hunt in your child’s toy box, cupboard or closet and you may be surprised at what you find that can be incorporated! Once I began doing that, I realized that I could use toys and tools in ways other than their originally intended purpose. It made things so much easier for me and also more fun for Andrew because while he might recognize the objects, he never knew how I was going to have him use them. I just love ideas that help me use the element of surprise to keep him engaged with me!